Since its establishment in September 2003, Ghana’s National Health Insurance Scheme (NHIS) has captured the attention of the global health community as one of the most ambitious plans for universal health coverage in Africa. Currently covering an estimated 35% of the population, the NHIS offers a wealth of lessons around ways to raise revenue for health, organize purchasing from public and private providers, and provide financial risk protection. 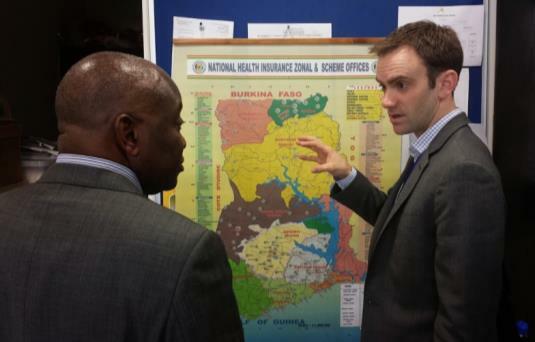 HFG’s Nathan Blanchet reviews the NHIS coverage map with Director of Management Information Systems Perry Nelson. USAID recognizes that ensuring the long term sustainability and success of the NHIS is a critical component of achieving the objectives of the country’s Health Financing Strategy and will require broad, forward-thinking discussions and strategy development. Key priority areas include increasing coverage, refining provider payment systems, improving quality of service delivery, strengthening support systems and management, and using evidence to continuously improve NHIS implementation. Support the NHIA as an evidence-based health purchaser by enhancing the NHIA’s claims data collection and analytic processes, strengthening monitoring and evaluation across NHIS operations, and by identifying and improving NHIA’s internal performance management practices that directly affect the generation and use of evidence for health purchasing. Approximately 20 NHIA directors and managers serve on a steering committee for the development of a monitoring and evaluation dashboard for the NHIA. “The work is not done – it is a first step. As a committee, we have a lot more work to do,” noted Dr. Lydia Dsane-Selby, the NHIA’s Director of Claims, after a workshop on dashboard development facilitated by HFG in May 2014. Photo: HFG.